Herefordshire is the historic county with something for everyone. Foodies will revel in market towns with local produce and homebrewed ciders; outdoor enthusiasts will love the breath-taking countryside, angular rock faces and River Wye; and literature-lovers will be right at home with a visit to Hay-on-Wye’s famous bookshops. Bordering Wales, this English county is rich in art, poetry, history and literature with festivals and events to awaken every sense. When it comes to camping, Herefordshire is equally diverse with traditional campsites, luxury glamping and quirky yet brilliant places to pitch a tent or park up a campervan. Whether you want a relaxing riverside retreat, luxury camping for the literary festival or a base for adventure, you’ll find it among our hand-picked Herefordshire camping and glamping sites. 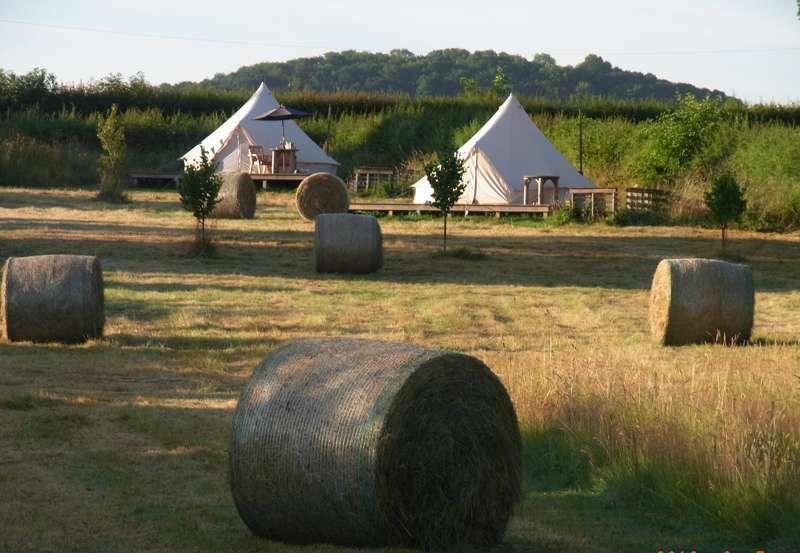 Luxurious bell tent glamping in an idyllic meadow – Herefordshire Glamping is the very essence of rest & relaxation. 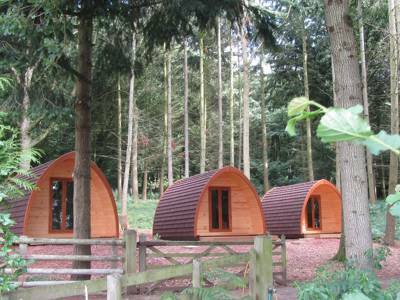 Luxury yurt and tipi camping in a magical woodland setting. 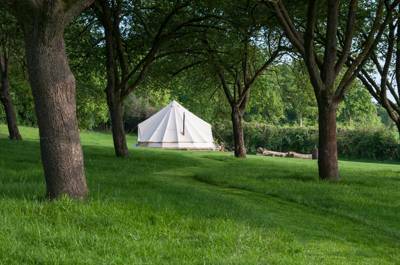 Luxury yurtand tipi camping in a magical woodland setting. As one of the most rural and sparsely-populated counties in England, Herefordshire offers perfect country camping and glamping. The beautiful Wye Valley, which curves through the county, is one of its chief attractions. You can walk on the river’s edge, take to the water by canoe or explore the many towns and villages that cling to its banks. There’s Ross-on-Wye with a lofty position over the river, Hereford itself with its gothic cathedral and, just over the border in Wales, Hay-on-Wye, with its famous literary festival, to name just a few. In the north-west of the county, there’s a string of medieval villages which are just as fascinating to explore. But more than anything, Herefordshire is an outdoor lover’s paradise. Situated on the border of England and Wales, it has protected landscapes in every direction. In addition to the Wye Valley Area of Outstanding Natural Beauty, its southern edge meets the Forest of Dean, the Malvern Hills reach its eastern edge, the Shropshire Hills are to the north and the Brecon Beacons National Park to the west. All are great places to explore and, of course, camp. There are campsites and glamping sites to suit all tastes too; from simple places where adventurous campers can pitch their tents amid all this rural scenery to glamping sites where luxury is second-to-none. The Cool Camping approach to camping does not endorse the old adage that bigger is better. We tend to look for places that offer a special atmosphere, location or a particularly warm welcome: often these are smaller, more independent sites and, thankfully, Herefordshire has plenty of them. Traditional back-to-basics campsites are not hard to find in Herefordshire and we’ve sought out the best of them to feature in the Cool Camping collection. We’ve got a soft spot for tent camping and rural Herefordshire is one of those places where pitching a tent just feels right. Holiday this way and you’ll have a minimal impact on the environment and will only ever be steps away from the rural scenery you’ve come to see. You can be self-sufficient like the farmers whose land you’ll be pitching on and adventurous like the guides who’ll show you the ropes if you’re climbing or kayaking while you’re here. Herefordshire campsites come in a variety of shapes and sizes; from tiny places where a few tents can pitch together to sociable sites where you can get to know your neighbours. 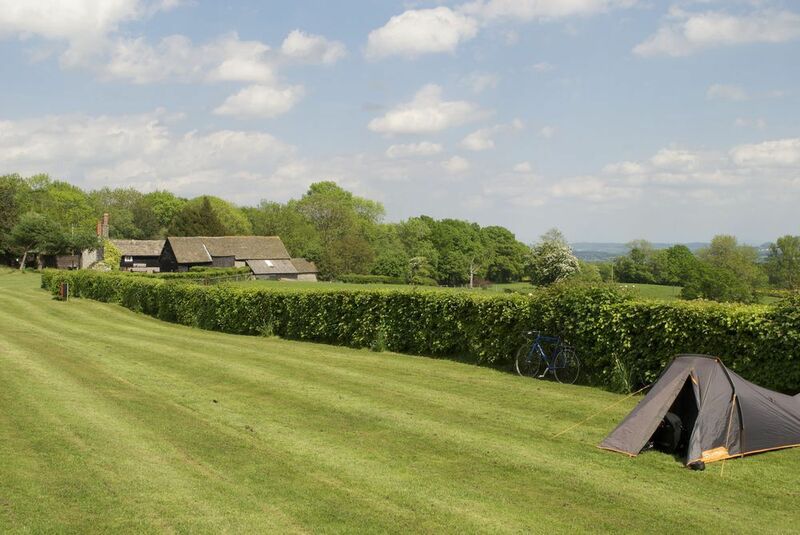 Regardless of size, most tent camping sites in Herefordshire will feature grass pitches as it’s rural meadow camping that leads the way in this land-locked county; the sort of places where you can enjoy countryside views and wildlife watching. With the dark skies of rural Herefordshire above, you can enjoy star-gazing before bed and wake to the sound of birdsong in the morning. If the simple pleasures of camping appeal but the (sometimes) basic facilities don’t, how about a glamping holiday in Herefordshire? If you don’t own or a tent or just don’t fancy pitching one, glamping provides a way to get a taste of the good life and the great outdoors without any of the hassle. 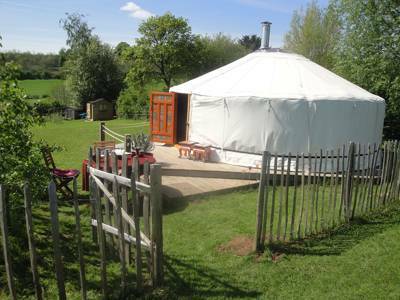 Herefordshire has a great range of glamping sites offering everything from simple bell tents on pop-up campsites to incredibly luxurious shepherd's huts, yurts, safari tents and more. You can choose somewhere that simply has a bell tent set up waiting for your arrival or somewhere that has electric hook-up and all mod cons inside – perhaps even with a hot tub on the doorstep. The UK glamping scene includes a lot of quirky options too; from converted horseboxes and old-fashioned gypsy caravans to treehouses and tipis. 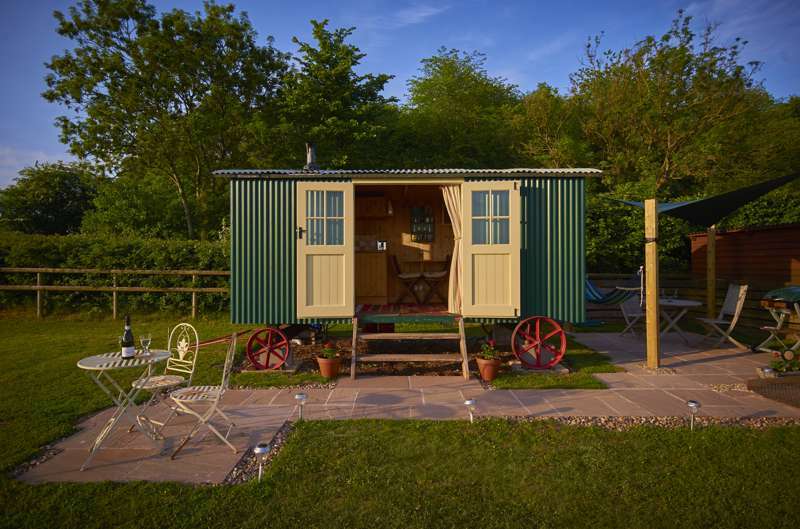 Herefordshire has its fair share of quirky options and with glamping and staycations on the up-and-up the range is always changing. We keep our eye on new camping and glamping sites to make sure our collection is up-to-date so we’re always bringing you the best camping and glamping sites in the places you want to visit. Ask anyone what they know about Herefordshire and, even if they’ve never visited this part of England, they might vaguely mention cows. Hereford beef is world-renowned and rightly so. The county is largely rural and agriculture remains its biggest industry with beef from its Hereford cattle being one of its main “exports” and an unofficial symbol of the county. Herefordshire is also big on cider, like other parts of the West Country. Orchards make up a large part of the countryside and both large-scale and artisan cider producers press the county’s apples. In fact, the largest cider mill in the world can be found just outside Hereford – where the popular Bulmers and Strongbow ciders are made. You can visit a cider producer to find out more about the process of turning apples in to cider and juice, or even camp among the trees of an apple orchard. There’s more to Herefordshire’s food scene than beef and cider of course and you’ll find plenty of pubs and restaurants that are proud to use Herefordshire produce in their menus. As you’d expect from a largely rural county, there are farm shops and farmer’s markets where you can buy straight from producers too – and for a true taste of Herefordshire, what could be better than cooking a juicy Hereford beef burger on an open fire at your campsite, while sipping a locally-produced cider? Herefordshire has some great walking routes including part of the 177-mile long Offa’s Dyke path. This long-distance national trail follows the English/Welsh border along the route of Anglo-Saxon earthworks (the dyke) designed to keep the kingdoms separate. Hiking and camping along the route can be a rewarding challenge and usually takes about two weeks. There are a number of other long-distance routes in Herefordshire including the Wye Valley Walk and plenty of footpaths to take you through the stunning scenery of both the Wye Valley Area of Outstanding Natural Beauty and the Malvern Hills AONB. Walking is, in fact, such a popular activity in Herefordshire that it even has its own festival which takes place in June each year. 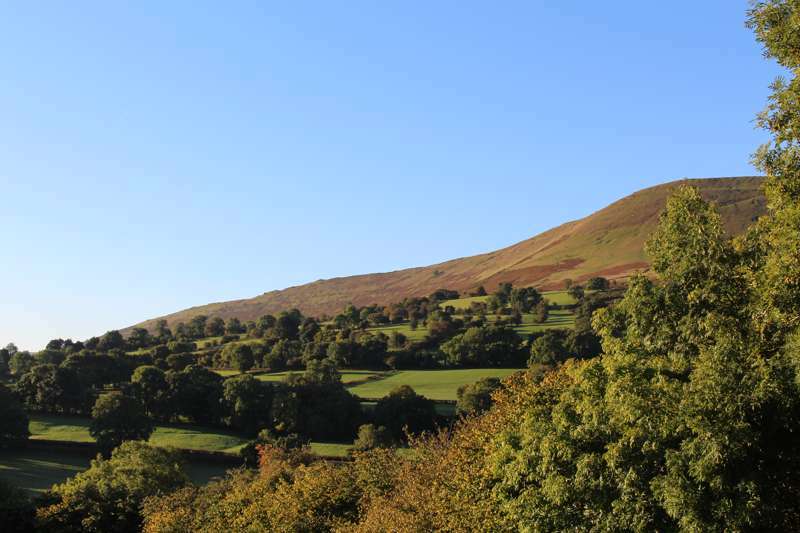 If you like a hike to be rewarded with a view, head to the west of Herefordshire and the Black Mountains, part of the Brecon Beacons where there are a number of peaks at more than 600 metres. If you prefer even more adrenaline you might want to camp near Symonds Yat, the Wye Valley’s adventure centre. From here you can hire kayaks and canoes to take to the water and perhaps climb Yat’s Rock. There are adventure activity companies to help you make the most of the white water of the River Wye around this area and to take you in to the nearby Forest of Dean where cycling, horse-riding, high ropes and zip wires offer more thrills and spills. Technically Hay-on-Wye is in the county of Powys in Wales – but if you’re looking for camping near Hay-on-Wye, then it’s not just Welsh sites you’ll be looking at. Only a little brook separates this town of books from Herefordshire and there are lots of camping and glamping sites that are perfectly placed just a short walk or drive from its high street. Hay-on-Wye is renowned for its second-hand and specialist bookshops and for the Hay Festival of Arts and Literature, which takes place at the end of May and beginning of June. The event attracts writers from around the world and thousands of fans too, so if you’re thinking of joining the fun you might want to get your pitch booked up well in advance. With spring flowers everywhere and early summer sunshine as well as the excitement of the festival’s events, it’s a wonderful time to camp in Herefordshire. But if you’re a bibliophile you’ll love visiting Hay-on-Wye at any time of the year and outside of festival time there’ll be less people crowding those book shops so you can find something to get stuck in to. What’s more, your rural camping or glamping site will give you the perfect place to do just that! Market towns, sleepy villages and farms… Herefordshire has these in abundance and there are some gems that you may want to visit on a camping trip. The county town and Herefordshire’s only city, Hereford, is small by city standards and centred around its cathedral and pedestrianised old town. Inside the cathedral, is one of the city’s greatest treasures – the Mappa Mundi, the largest medieval map in the world. The city also has a cider museum and there’s tourist information in the Discover Herefordshire Centre. The medieval timber-framed buildings of Leominster make it one of the most popular market towns with visitors, but it’s far from the only one. Take your pick between Bromyard with its independent shops and cafes, Kington with its weekly livestock market and reputation as a centre for walkers and Ledbury, once home to the poet Elizabeth Barratt-Browning and where markets still take place twice a week. Leominster and Kington are connected by the Black and White Trail, a 40-mile circular route for drivers or cyclists through rural orchards to see picturesque villages including Dilwyn, Kinnersley and Pembridge among others. The spectacular location of Ross-on-Wye, above the river, makes it perhaps the most popular of the market towns. Nearby Symonds Yat on the Yat Gorge is another popular place on the southern edge of Herefordshire – a village linking the Wye Valley with the Royal Forest of Dean with a reputation for all things related to the great outdoors – and a number of tourist attractions too. At the other end of the county, in the north, is an area known as Mortimer Country, named for the Norman Mortimer family who once ruled the area. There are lots of historic sites associated with this period of medieval history including Wigmore Castle but it’s the scenery of ancient woodland and water meadows that attract most people to visit this area on the edge of the Shropshire Hills Area of Outstanding Natural Beauty. Stoke the barbecue at your campsite and cook up a juicy Hereford beef burger. Take a walk along Offa’s Dyke on the border between England and Wales. Eat an apple fresh from a Herefordshire orchard (with permission from the farmer of course!). Cycle or drive along the Black and White trail to see the medieval timber-framed buildings. Take a look at Europe’s largest medieval map, the Mappa Mundi in Hereford Cathedral. Find out how cider is made at Hereford’s cider museum or with a tour of one of the county’s many cideries. Kayak, canoe or raft on the white water of the River Wye. Find a spot on the border where you can stand with one foot in England and one foot in Wales! Hint: head for Cusop near Hay-on-Wye. Cross the border in to Wales to visit Hay-on-Wye and browse the second-hand book shops. Count the cows! Look out for Hereford cattle as you drive to your campsite – makes a change to i-spy as a way of keeping the kids occupied! 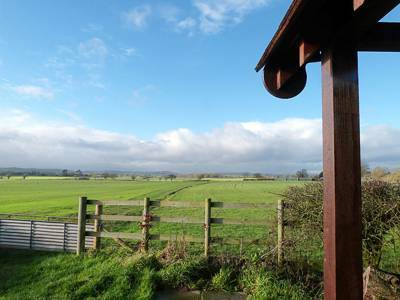 Herefordshire at Campsites in Herefordshire, Looking for a Herefordshire campsite? Discover the best campsites in the county with this expertly chosen collection from Cool Camping, including riverside campsites, woodland campsites, dog-friendly campsites and even luxury glamping. Find all the best Herefordshire campsites now and book them instantly at the best price.